This beautiful bow is created with a classic white satin accented with a shiny gold ribbon overlay. Flag back is a complimentary classic red satin ribbon. 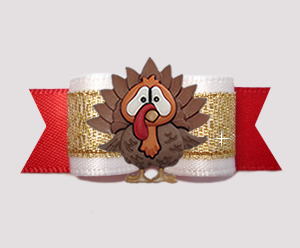 Best of all, securely stitched to the center of this unique bow is a turkey. A beautiful bow sure to get a lot of attention over the holidays!